Happy Sunday, Zelda fans! It is time for this week’s ZD Gallery feature. Just to recap, since this is a new series to Zelda Dungeon, the ZD Gallery is where we pick an artist among us Zelda fans out there that has created something to show their love for the franchise and, not only shine a spotlight on their work, but the artist themselves. For this week’s installment, we were able to chat a little with an artist known on Tumblr as Nox Zaiden, who created this beautiful piece titled Din’s Fire. Make the jump to read the interview! Of course, it’s quickly becoming a pattern to start by asking each artist how they became interested in the series and what their favorite game is- if they have one. Here is what Nox said. ZD: When did you become a fan of the Zelda series? Nox: I suppose in a way, I became a fan when I was about eight years old or younger. I did not actually play the games at this time, but my older brother owned Ocarina of Time for the N64. I remember picking up the gold cartridge having no idea what it was about, but being profoundly fascinated by it. And at times I would watch my brother play. My siblings tell me that Link was my favorite, but I do not really remember- after rediscovering the games later though, he is (still) my favorite character today, and most likely always will be. Nox: I am always unable to pick a favorite game out of the series; Ocarina of Time is the most nostalgic for me, but I am also very fond of Terada Katsuya’s concept versions of Link, as well as the Fierce Deity. ZD: Focusing specifically on your piece titled Din’s Fire, what was your inspiration? Nox: When I finally got around to playing Ocarina of Time I was in my early teens. 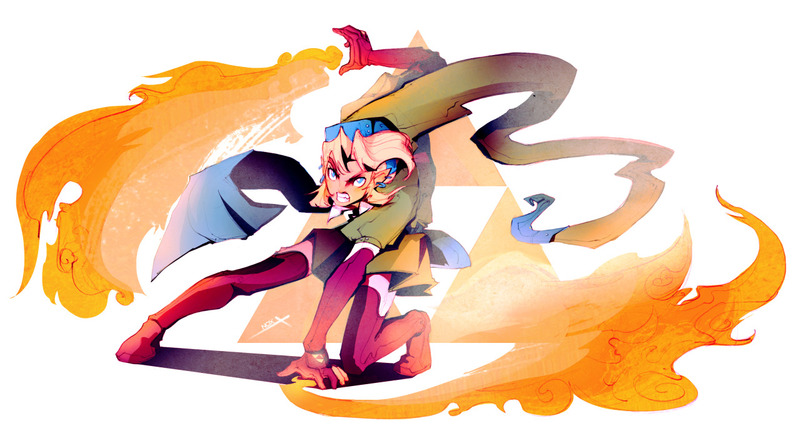 I did not know much about the game prior to playing it, and so I was not aware that Link could use magical attacks. When I equipped Din’s Fire and used it for the first time, I was so taken with how awesome it was that I had to pause the game, put down the controller, and do fan art of it. That was some time ago; this Din’s Fire was my more recent attempt to revisit that moment. I do not think the finished piece quite contains what I felt at the time though, so I will most likely do the piece yet again in the future. ZD: What mediums did you use to create it? Nox: I tend to use this process often: I create a gestural marker sketch of the piece, redraw it as a more clean line drawing in pencil, scan the piece, and then paint it using Adobe Photoshop. ZD: Does it have a message, or was it created just for the sake to show your love of the series? Nox: Seeing Link use Din’s Fire in the game, I was enthralled with the idea that he was capable of using magical attacks, aside from swordplay. 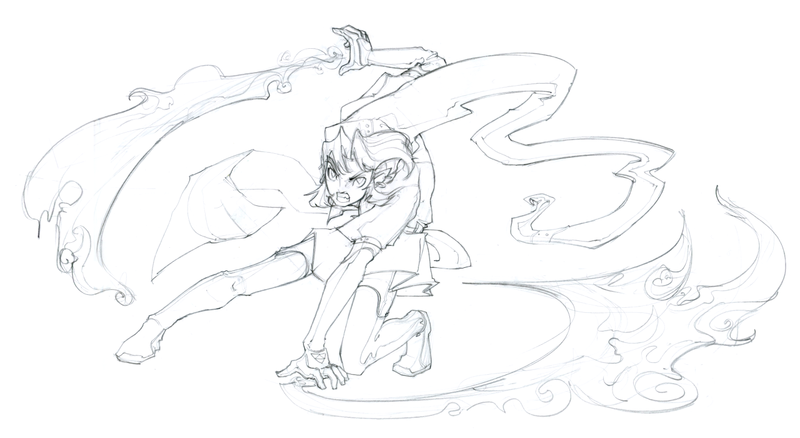 And not simply casting a spell, but magic that seems to require a stance or move set- I suppose it reminds me a little of martial arts forms. I have a similar fascination with Majora’s Mask when Link dances while wearing Kamaro’s Mask. I did not have a particular message in mind for this piece, I was just holding onto a specific feeling. But it is a hope of mine that future Zelda titles will incorporate some of these unique aspects into Link’s fighting style, to lend to the broader range of skill that he seems capable of using. ZD: Do you sell prints or other kinds of merchandise featuring your work? Nox: I generally feel…uncomfortable profiting from properties I do not own. This makes it a bit difficult to distribute any prints or merchandise of the fan art that I create, for those that request it- such as selling for solely the cost of the print. So currently I do not have items available for purchase. Sometimes, though, I do have small free prints distributed at the 626 Night Market. Currently I am working on various original projects, so these items may become available for purchase in the near future. ZD: Last question: Do you have any ideas for future projects? Nox: I am working on several collaborative projects, though unfortunately I cannot disclose any information about them until they are released. But, in terms of fan art, I can mention that I have several fan designs- for Dragonball, Final Fantasy X, and Zelda- that will be posted in the near future. 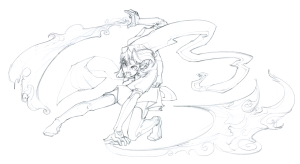 As mentioned, Nox has several other fan art pieces for franchises like Avatar: The Last Airbender, Rise of the Gaurdians, and even Sailor Moon. Nox does have more fan art for Zelda, though, including this piece of Link from Zelda Wii U in a very similar style to that of Din’s Fire. To see more, check out Nox’s Tumblr here! What do you guys think? I personally really like Nox’s art style and I absolutely love this piece. Would you like to see this drawing as perhaps part of a series, to include Nayru’s Love and Farore’s Wind? And what are you thinking of the ZD Gallery so far? Are you interested in featuring your own art? Feel free to make a submission for the ZD Gallery by sending me an email at alasyneletha@gmail.com, and we’ll take you into consideration! As always, don’t forget to leave your thoughts in the comments below!